After months of quietly bubbling community demand, it looks like Dice is considering a rent a server programme (RSP) for Battlefield V. At the very least, the developer has asked about its importance to the community in the latest survey – along with tractors, for some reason. The survey polls players on the community managers’ performance and on how the new battle royale mode, Firestorm, is going down. Then there’s a question on how important RSP is to the recipient on a scale of 1-10, and whether they like tractors. The only answers to this last one are varying degrees of affirmative, from “yes” through “of course” to “they are all I can think of, day and night.” Perhaps they’re coming to Firestorm or something, I dunno. The ability to rent a private server where you can set your own game rules has been a hallmark of Battlefield games for most of the series’s history, having been available on PC at launch in all games up to and including Battlefield: Hardline. 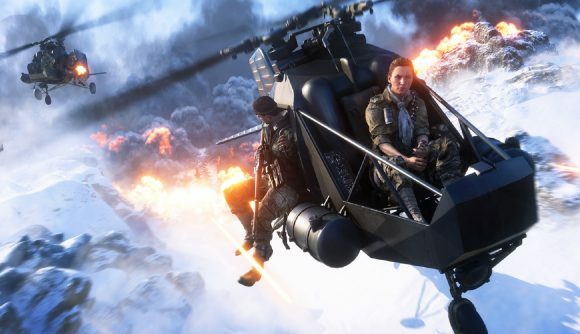 It was omitted from Battlefield 1, but added later, and fans have been eager to see its return to Battlefield V.
Despite Mitre’s assurances that RSP was not “off the table,” many in the community took this uncertainty as a bad sign. There was another spurt of good news earlier this month, when Dice said “had a meeting on RSP today. More to come.” And now, this. I guess the final decision now rests on the response to this survey. Private servers are fun to just play around in, but for Battlefield’s competitive community, it’s more serious than that. Many of them feel that the game is too casual and would appreciate the chance to tune it so as to create a more exacting experience. There’s little doubt that it extends the lifetime of a game and entrenches its community, and the demand has been clear to see – we’ve noticed players ask for updates on RSP after pretty much every patch.